Sage’s new DART rods are all about the fun. Despite their fun-loving casting style, these little rods are serious creeking tools, tailor-made for the close quarters upstream casting environment. When I cast a series of fly rods I often find that one or two rods in the lineup do not jive with the rest of the group. Maybe the shorter rod doesn’t feel as good as the longer one, or the 4-weight 9-footer doesn’t remind you at all of the 5-weight 9-footer. Across the board, the DART models are all strong; they cast and feel like a match set with the Rio Creek line. If you’re looking to pick up one of these rods, simply ask yourself how light of a touch you would like. Pick a corresponding Rio Creek line and do not worry, you have made an excellent choice. I actually wish Rio would simply include the line with the rod for a higher cost, it is that perfect of a pairing and necessary to making these rods sing. Bottom line, do not fish this rod with another line, put the Rio Creek on there and you will be very impressed, happy and satisfied. Put another line on there and I do not think you will witness the rod’s full potential. If you have read this and still fished another line on the Dart rods, then I can’t help you. Not without a Rio Creek line anyway. All of the DART rods are three-piece models. Now some of you are going to ask, why aren’t they four-piece models? The word from the horse’s mouth, Jerry Siem, is that the three-piece configuration moves a ferrule out of the center of the fly rod. With a three-piece rod at 7-foot 6-inches, the middle of the rod is in the center of the middle section. When you take a 4-piece rod apart, what is in the dead center of the blank? I know ferrule technology has come a long way, but I like the idea of the middle of the blank being a smooth piece of KonneticHD. Also, I trust Jerry Siem’s opinion on the matter. Cast one of these and I bet you’ll feel the same. DART rods are built using KonneticHD technology and sport a very attractive looking Sapling Green blank. Paired with Bronze thread wraps and Gold accent wraps, you have an attractive old school looking blank with modern casting capabilities and components. A vera wood insert (similar to the X rod) and bronze anodized uplocking hardware round out an attractive little creek rod. Pair it with a Sage Click 0/1/2 in the bronze finish and you’ll have a sharp looking, classically styled, modern creeking outfit. Overall, I think these rods turned out exceptionally well – great casting, great looking rods that go in a slightly different direction from Sage’s current form. The DART rods remind me of rods from Sage’s past and I like that they stepped out of the box a little with the three-piece configuration. Further, Sage made a killer 7-foot 6-inch series of graphite rods, not the easiest length for that material. I personally do a lot of creeking in the summertime after the shop closes in the evening and I’m really looking forward to playing with these little rods right through the town water in Telluride and on our little cutthroat creeks out the back door. Unfortunately, there was no Creek line at the show in a WF0F or a WF1F, so I will not be able to give you the full run-down on this rod until I get to cast this rod with the appropriate line. I did cast the rod with a Trout LT DT1F and it was fun, cast well, but it did not cast nearly as well as the comparable models with the Creek line. Personally, I do not care for the Trout LT in any of its line weights. I fish Rio lines almost exclusively, but I just don’t like the shape of the Trout LT or the way it casts on any rod. One man’s opinion. Stay tuned or give us a call for more info on this otherworldly light fly rod. I am very intrigued by this little rod. This is the one DART model that plays well with lines other than the Creek WF4F. 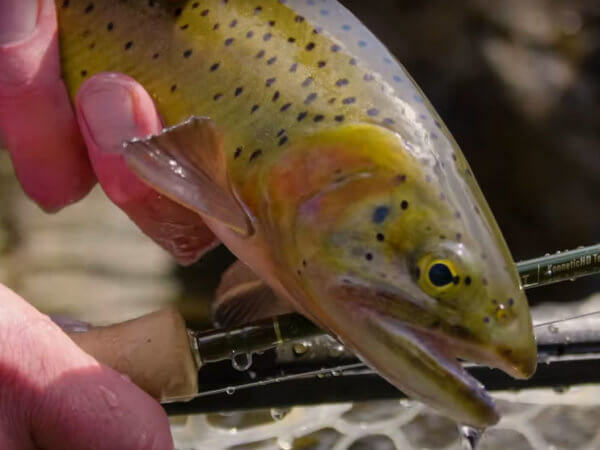 With the Perception, the rod handled nicely and it is a viable choice for an up and coming fly fishermen looking for a creek-length rod with a little more all-around play. Think Southern Appalachian freestone and creek rod combo. With the Rio Gold, the rod was tighter (narrower timing window), but I got more feedback from the rod with the Gold. Not surprisingly, the Creek WF4F was my favorite line on the rod and it was a ton of fun to cast. The DART 4-weight cast with wonderful stability and a confident and distinct pause in the backcast. The 476-3 is equally at home pulling bigger trout out of tight creeky spaces (Creek WF4F) or fishing a dry dropper through the summer months on a small to medium freestone (Perception WF4F).